The fancy bookstore at my local mall is going out of business/bankrupt and they have the clearance people in there to liquidate. I haven’t been able to get over there until Friday afternoon, when I was lucky enough to be allowed to leave work early for the holiday weekend (hurray!). This ended up being a good thing, since lots of books were only marked down 30% off retail after about 2 weeks of liquidation. 30% is about what you can get on Amazon, so I was disappointed and wandered around the store for a long time with just one book in my basket. But they announced if you bought 3 books, you get an additional 10% off everything and if you buy 6 books you get an additional 20% off everything. So I ended up getting 10 books. 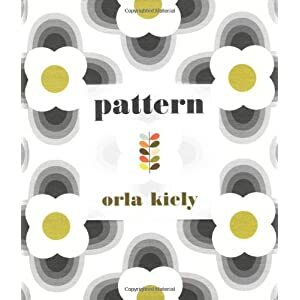 Probably the two I am most excited about are Orla Kiely’s Pattern and Brewer’s Dictionary of Phrase & Fable. I love to read, but rarely spend a lot of money on books (since adolescence anyway) since I don’t like to waste the money, or have to store them, or more and more lately I don’t have the time to read very much. Today I didn’t have anything I needed to do, so I stayed home and read an entire book. My initial thought was basically eye-rolling, but then when I learned a little bit more, I felt I could relate somewhat, even though I’m not exactly a teen. I don’t get upset about friend counts, because I’ve always preferred to have a few close good friends, than a large number of false friends or just acquaintances. Sure, I use Facebook to keep tabs on people that I might not ever see face-to-face again, but I deleted a bunch of people that I once knew, but who I never interact with even online. In addition, seeing photos, or hearing about events that you were not invited to, or included in, can be hurtful. This is the part that has gotten me in the past. I’d go through a cycle of seeing photos of happy shiny friends having great times at parties and other events that I was never invited to, getting really upset, getting over it, then seeing similar photos all over again. I never said anything to the “offenders” in these cases, but I eventually made the personal decision to just remove these accounts from my Facebook. I’m not sure if anyone has noticed. I have never gotten any emails, phone calls, or other comments since. And in this case ignorance has not quite been bliss, but has stopped salt from pouring into my wounds. I can’t imagine how hard a situation like this would be to a teenager, when everything in the world is SO DARN IMPORTANT. I think I am very lucky I didn’t have to deal with so much social media when I was a kid. I spent the weekend at the beach. 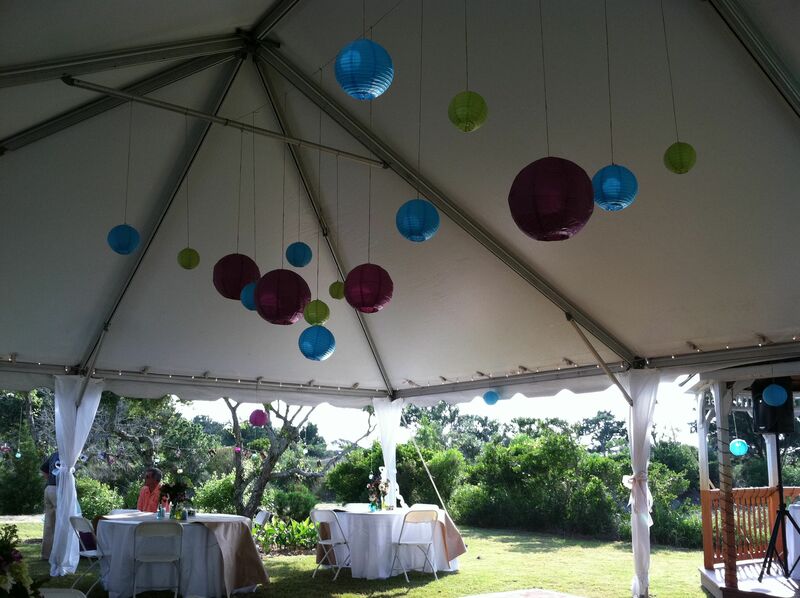 My friend Samantha put on a fabulous party that included a wedding. I’ve known Samantha since we lived on the same hall our Freshman year at James Madison University. We were both art/graphic design majors, but I don’t think we ever had a single class together. She’s from Richmond, so I spent time visiting her (and sometimes her family) on breaks from school. Now she’s a badass web designer in Northern Virginia, and basically who I want to be when I grow up. Samantha met Jim at a conference they were both working (they are both designers) Jim proposed to her at SXSW. Her engagement ring is a black diamond. This is a cool couple we are talking about here. I know Samantha stressed about the wedding planning. She’s extremely thoughtful, so naturally she wanted everyone to have a great time. There was no bridezilla stuff. 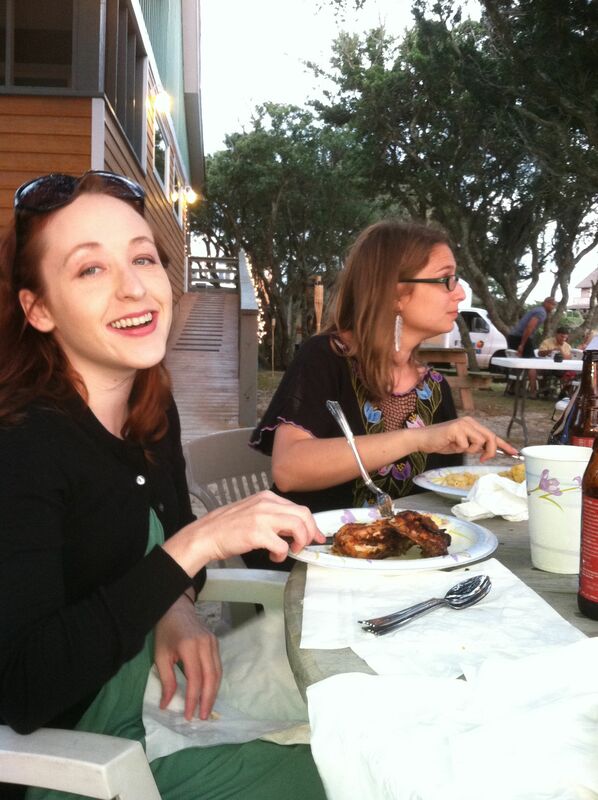 Samantha and Jim spend their rare downtime at the beach, especially the Outer Banks area. 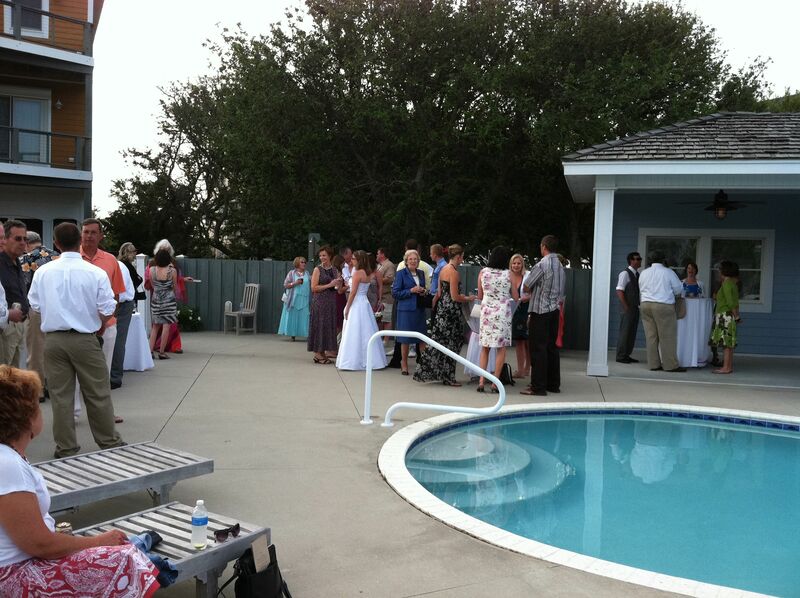 Samantha got the idea to have the wedding in Frisco, on Hatteras Island. They rented a huge house (The Love Boat) where they hosted a beach barbecue Friday night. 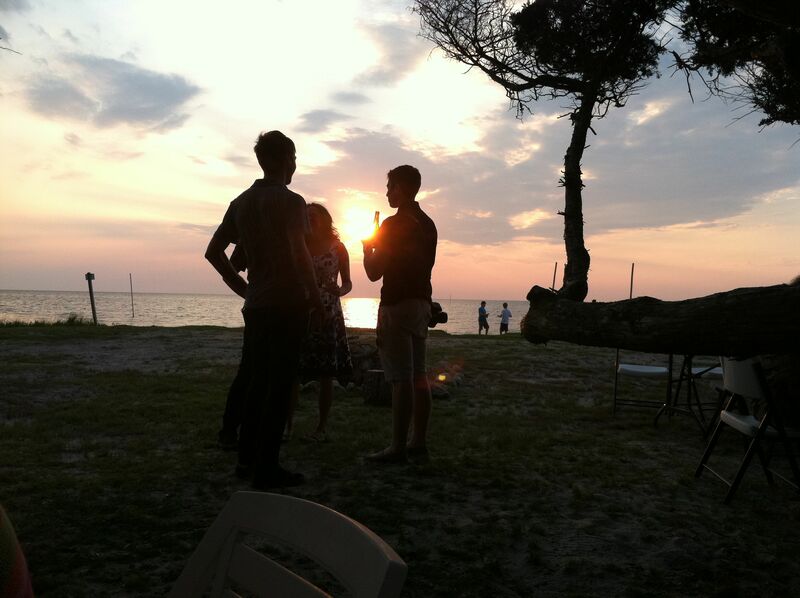 The wedding ceremony was held on Saturday, in the sand at the water’s edge, just before sunset. Cocktail hour was around the pool and then the guests moved around the back of the house, under a tent, to eat, drink and dance. I am pretty sure Samantha was on the dance floor for every song. It was great to attend a wedding where the bride and groom are actually having a fantastic time. 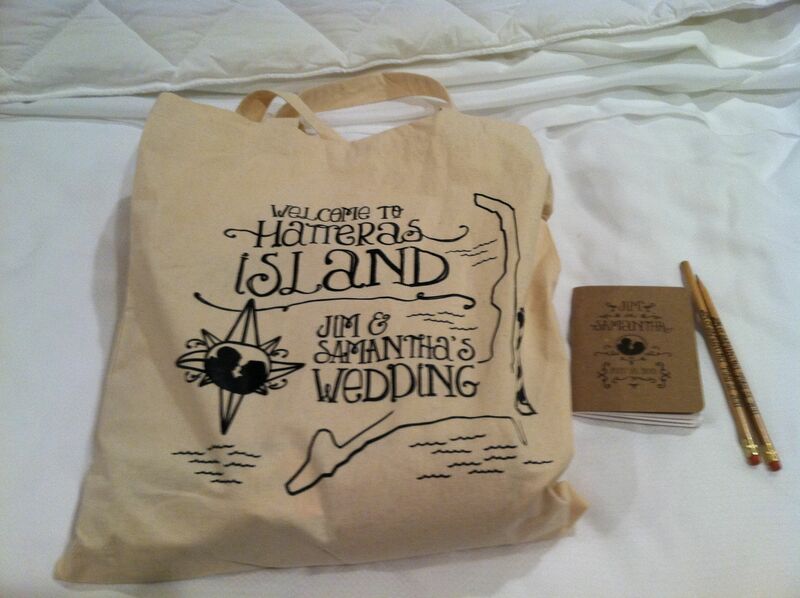 The wedding decor and ephemera were all DIY by Samantha and Jim. They designed the invites, program, website. Even wooden signs directing guests where to park were designed in the same hand-drawn font. 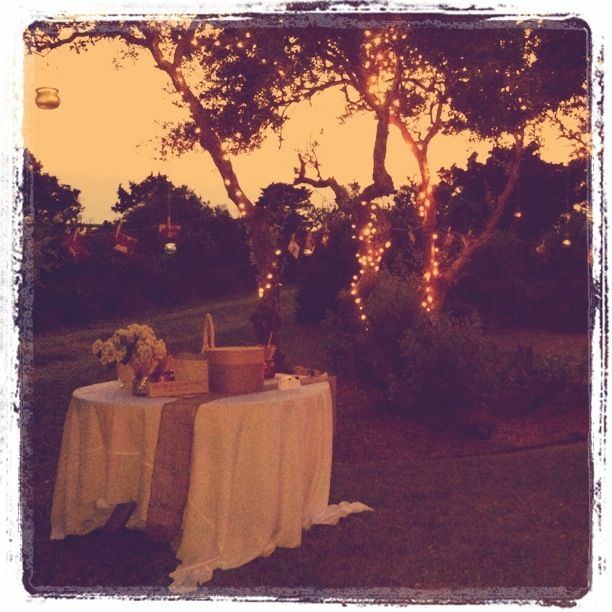 Samantha decorated with tiny multicolored vases on each table, paper lanterns, strings of white Christmas lights, and old family photos pinned to makeshift clotheslines strung between trees. There was a guest book that encouraged doodles. The favors were custom printed mini notebooks and pencils and tote bags (again with a complementary design) filled with treats for a day at the beach. I think the tote bags are especially cute/cool/nerdy since they so strongly evoke a design conference to me. Samantha seemed both genuinely surprised and happy that I made the trip down for the wedding. I wouldn’t have missed it. Over the weekend I picked up a “magic dress” of my own. It’s from Target’s Merona line and comes to me thanks to a tip from Looks Good From the Back: Marianne and Adrien. I’m pretty sure they should get commission. Today is the 7th annual World Lupus Day. While I don’t have Lupus myself, I know a lot of wonderful ladies who struggle with the disease. Also, since Lupus is an autoimmune disease, I can relate to a lot of what Lupus patients have to go through. You can read more about World Lupus Day here. Read some stories about Lupus (and other diseases) at But You Don’t Look Sick. 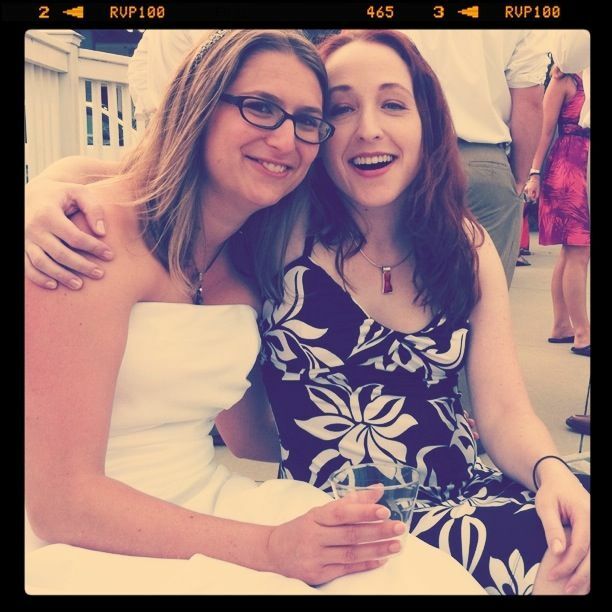 Donate to my friend Stephanie’s Lupus Walk fund. I had people over to celebrate my birthday (which was last month). My friend Justin showed up unexpectedly and brough fancy cupcakes from Charlottesville. They were from Cappellino’s Crazy Cakes which is apprently pretty well known in that area. The cupcakes were way better than the famous DC area cupcakes I’ve had, like Georgetown Cupcake or CakeLove. I am not a big fan of either of those, but if someone gave me a free cupcake, I’d probably eat it anyway. Capellino’s is the real deal though. I even ate one of the leftovers for breakfast!